To celebrate the 50th anniversary of the original Star Trek TV series, BBC America ran all the original episodes in the order they aired. I recorded them all and have been watching two or three per night (still have 40 to go). 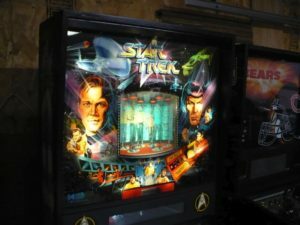 We currently have two of the four Star Trek themed pinball machines for sale. 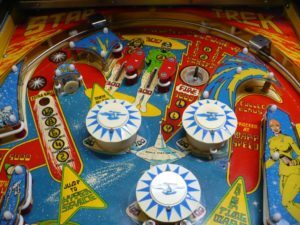 The first one was produced by Bally in conjunction with Star Trek: The Motion Picture in 1979. This game is similar to most of Bally’s titles from the late 70’s and early 80’s. It has nice ball flow with a good range of shots. Since it is not digital, all the sounds are produced by chimes. 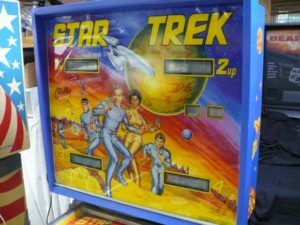 Below is a photo of the Bally Star Trek we have for sale. The second title was produced by Data East in 1991. This game has more features on the playfield and ramp shots that make the game faster. It also has a transporter effect in the backglass that makes it look like the characters are beaming down to a planet. The game includes both speech and music. 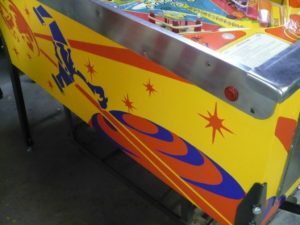 Below is a photo of the Data East Star Trek we have for sale. Please call or e-mail us with any questions or for more photos of either game. The third title is Williams Star Trek: The Next Generation, from 1993, which features characters and scenarios from the 90’s TV series. As a much newer game, it features a wide range of shots, video modes, full speech and sound and elaborate game play. We do not currently have one for sale, but would be able to locate one. The fourth title is very recent. 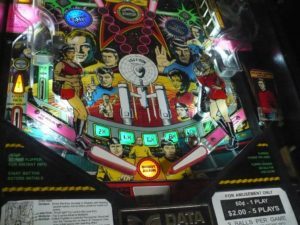 In 2013, Stern produced three models of their Star Trek pinball machine. Stern’s standard edition is the Starfleet Pro and its two special editions are the Enterprise and Vengeance editions (named for the two star ships). 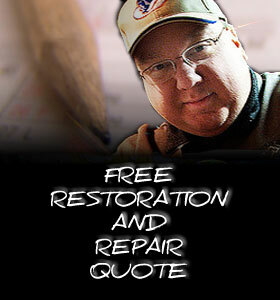 We do not typically sell new games, but would be able to handle delivery, installation and ongoing service. 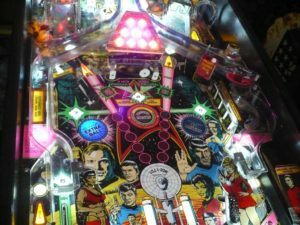 This entry was posted in Blog and tagged Star Trek. Bookmark the permalink.